Acer's larger-than-life B326HUL comes with great colour accuracy out-of-the-box, easy-to-use menu controls and good build quality, but its above-average response time, lack of MHL and price point may make you want to look elsewhere. When it comes to display technology, everything is getting bigger - from your smartphone to your television - to tablets sporting screens the size of laptops. PC monitors are no different, and with the market taking inevitable strides toward 4K and UltraWide QHD display technologies, the arrival of a 32-inch panel like Acer's B326HUL feels almost par for the course rather than something that would once have been considered a niche product. Despite arriving with a low-end 4K monitor's price tag of £462 (around $777, or AU$836), the professional-series B326HUL totes a more conventional WQHD (2560 x 1440) pixel resolution, rendering it something of a pricey option upon first glance. So what do you get for your money? In short, exceptional colour accuracy, a healthy selection of ports and sturdy build quality. But whether those are big enough plus points to steer you away from increasingly affordable 4K monitors will depend on what you're planning on using it for. You can't get away from it: the Acer B326HUL is huge. At 32 inches, it has more in common than your average living room TV than something that you'd sit directly in front of, and as such you'll need an adequately sized desk to house its sturdy frame (and keep eye strain at bay). It's heavy too, requiring the use of both hands when lifting and moving it into position. It comes with the arm attached to the base, which is easy to attach to the monitor's rear without the use of a screwdriver. The monitor sports a dark grey finish that's subtly attractive. It's attached to a sturdy base with a flexible arm that can be raised or lowered do a degree of six inches, with the panel itself able to tilt forward and backwards. Out of the box the monitor comes with one VGA, DVI, DisplayPort and USB cable. The B326HUL features a 2560 x 1440 pixel resolution (often referred to as 2K), which provides ample room for positioning multiple applications side-by-side. Its resolution also means that you won't have to fiddle with the scaling options in Windows 8.1 to make text clearly readable, as is sometimes required with 4K monitors. As an out-of-the-box solution the B326HUL is about as hassle-free as you can get. According to our calibration tool, the monitor displays 100% of the sRGB colour gamut - and that was before we'd even touched the menu controls. According to Acer, brightness is measured at 300 cd/2, with a contrast ratio of 100:000:000:1. The panel type is VA (Vertical Alignment), a type of display technology that's supposed to combine the benefits of both TN and IPS panels. It didn't disappoint, producing solid blacks and vibrant colours, and we detected no leaking from the display's backlight around the edges. If you're unsatisfied with the display's factory settings, picture quality is easily adjustable using the physical menu buttons located on the lower right-hand side of the bezel. They're a decent size and their corresponding controls are shown on the screen itself (rather than shown as labels on the bezel), making it easy and quick to tweak settings - such as brightness, contrast and colour temperatures - in a snap. 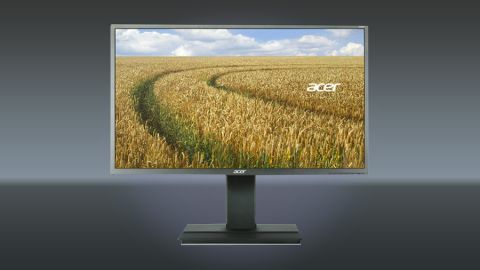 Acer claims that the monitor has a 178-degree viewing angles both vertically and horizontally. They're very good, but not excellent, fading at the edges at tighter angles - something that isn't helped by the monitor's massive proportions. It doesn't detract from the overall experience, but it's noticeable. Gamers too should be aware that although 60Hz is an adequate refresh rate for playing games, its response time of 6ms is rather high - particularly for fast-paced games such as first person shooters. We noticed slight ghosting during a round of Counter Strike: Global Offensive, particularly when running around dark environments. It wasn't enough to put us off our game, but if you're serious about competing or prefer a completely ghosting-free environment, you'll might want to consider a monitor with a 2ms or 1ms response time. The Acer B326HUL features DisplayPort, DVI-D and two HDMI ports which are clearly labelled, but are awkward to access if the monitor is positioned at its lowest height. You'll want to raise it to its highest position on its stand before plugging or unplugging anything. There are also two downstream USB 3.0 ports on the rear and one upstream USB 3.0 port mounted on the left-hand side of the display. Unfortunately the HDMI ports do not offer MHL connectivity, which seems like something of an omission on a monitor of this size at its price point. The Acer B326HUL is a solid performer with excellent (and highly configurable) colour accuracy and image quality out-of-the-box. Its spacious and attractive VA panel looks great, and if you're not happy with its factory configuration, the easy to use menus and extensive colour configuration options mean that it shouldn't take you long to get the desired effect. Its 2560 x 1440 pixel-resolution is a good fit for 32 inches, rendering images and clear while allowing text to remain easily readable. The panel itself oozes solid build quality from the base to the panel itself. On the negative side, viewing angles are good but not great. Gamers too should be cautious of its above-average response times. It's not the cheapest monitor either - if you're looking for an alternative, BenQ's BL3200PT is a very similar monitor with comparable features that retails for around £500 - though we're yet to review the model so can't compare the two at this time.